Several months after storms fueled by a fierce El Niño exploded over the northern Sierra Nevada, California’s mountain snowpack has nearly disappeared. Scientists bid adieu last week to an El Niño that had been among the strongest on record, but that brought disappointingly few wintertime snowflakes and raindrops to the Southwest. Snow that bucketed down in northern California during a string of March storms has largely withered during a sunny and warm spring. 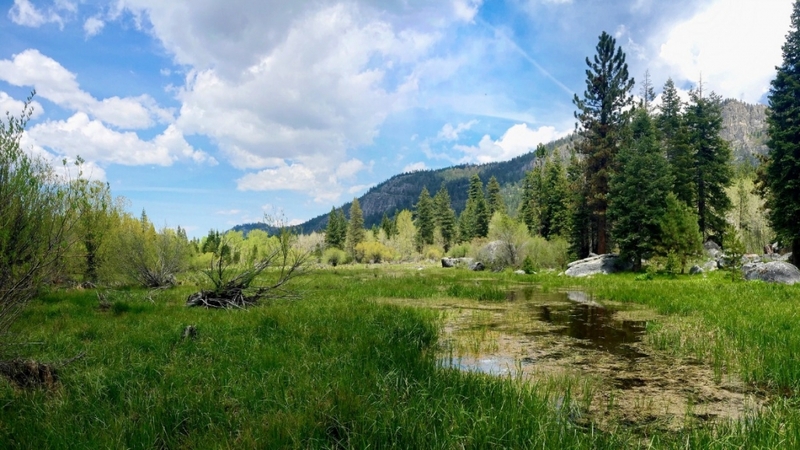 Snow-free conditions in late May near Lake Tahoe in the northern Sierra Nevada. Those unexpected meteorological forces pushed California into the fifth year of a drought that has already cost the state billions of dollars and thousands of farm-related jobs. The prolonged crisis is illuminating the need to reimagine how water is stored and used in the West as the world warms up. 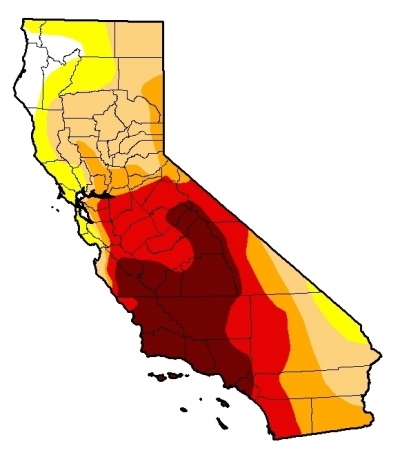 Most of California is unusually dry for this time of year and large swaths of southern California remain in “exceptional drought,” the federal government’s Drought Monitor shows. The projected arrival of El Niño’s counterpart, La Niña, is triggering fresh drought concerns throughout the region. Californians and their landscapes depend on winter storms to deliver much of their annual water needs. The Sierra Nevada snowpack serves as a giant natural water reservoir, gradually releasing water dumped by winter storms during warmer months. The state is naturally predisposed to endure protracted droughts, and climate scientists say climate change is exacerbating those hazards. The drought monitor published last week showed 21 percent of California remained in “exceptional drought,” shown in the darkest shade of red, while 96 percent of the state was abnormally dry. Figures from Gehrke’s department show the Sierra Nevada snowpack contains about 6 percent as much water as is normal for this time of year. That’s down from 90 percent in March following storms that eased drought in northern California but did little for the southern part of the state. 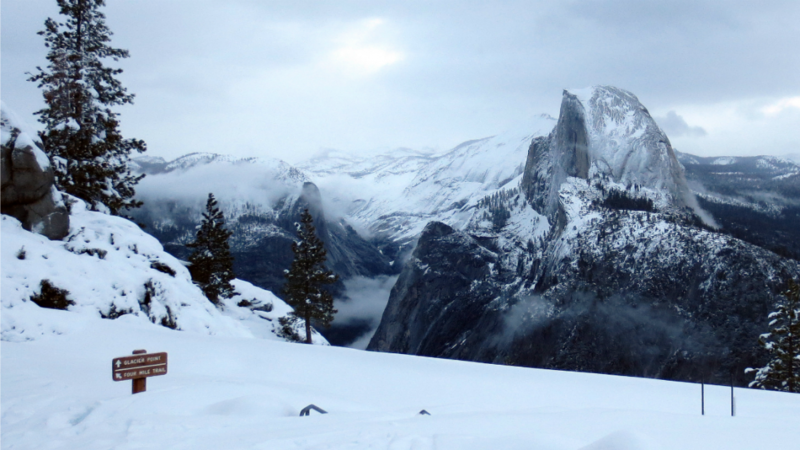 Rising temperatures caused by greenhouse gas pollution are projected to reduce California’s snowpack, because more snow will fall as rain, and because snow that falls will melt more quickly. That means Californians will need to learn to store more water in aquifers and reservoirs or use less water year-’round. Benjamin Cook, a researcher at Columbia University’s Lamont-Doherty Earth Observatory, said it remains unclear what roles climate pollution and natural variation played in the unusual conditions that have left California in drought. “This does not look like a typical El Niño year out West,” he said. A flurry of research will be published in the months ahead that could help explain any links between climate change and the latest chapter in California’s enduring drought. One thing is already clear, however: warmer weather in the West caused by global warming will mean less water for farms, homes and factories. Warmer weather accelerates the melting of snow and hastens the evaporation of water from rivers, lakes and soils. Climate change has pushed up average temperatures by nearly 2°F worldwide. Most of California was warmer than that from March through May, with federal data showing some patches of the state were more than 4°F warmer than average during the three-month period. “The last couple of years especially have shown the role that temperatures really play in some of these drought events,” Cook said. El Niño winters normally flood southern and northern California alike with rain and snow, but a high pressure ridge over the Pacific Ocean deflected storms from this year’s record-breaking El Niño northward, leaving southern California parched. “The atmospheric response to El Niño was very different this winter than in winters historically that have had strong El Niño events,” said Daniel Swain, a PhD candidate at Stanford who researches California’s weather. The snow that coated the mountains of northern California in the March has all but melted away. Meanwhile, unusually warm and sunny spring weather has already caused late winter snow that fell over montane northern California to melt nearly into oblivion. That helped top up reservoirs in northern California but left those further south unusually dry. Early summer is not a time of year when California’s snowpack is ordinarily bursting with aqueous bounty. But what has surprised scientists is how quickly the northern snowpack has virtually disappeared. Although California remains in drought, conditions have improved since last year, prompting the state government to ease water rules and restrictions. Editor's note: A paragraph in this story originally said climate change would cause more snow and less rain. It's the other way around. It will cause more rain.